To mark the 10th anniversary of the Centre opening its offices in Armagh, President McAleese hosted afternoon tea for the staff, board and selected friends of the Centre for Cross Border Studies at Áras an Uachtaráin. Among the guests were Dr Chris Gibson, Chairman of the Centre; Professor Ferdinand von Prondzynski, President of Dublin City University; Mr John Driscoll, Director of the International Centre for Local and Regional Development, and Professor John Coolahan, Professor Emeritus of Education at NUI Maynooth. 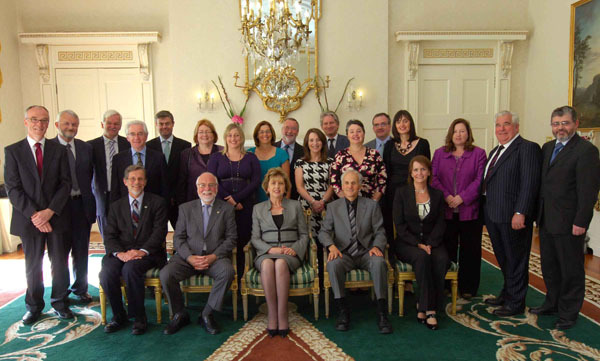 The board and staff of the Centre would like to express their heartfelt thanks and gratitude to President McAleese for recognising and affirming its work for practical North/South and cross-border cooperation in this way. The Irish Times also marked the anniversary by publishing an article on the Centre and its work.